HP’s new Pro Tablet 608 is its first Windows 10 commercial tablet designed to meet the needs of mobile executives for portable computing in a slate form factor. HP also unveiled new ISVs to help it develop vertical-focused approaches to business mobility. Running Windows 10, the Pro Tablet 608’s 8” display 2048 x 1536 high resolution features a 4:3 aspect ratio optimized for working with business productivity apps – HP boasts it provides 35 per cent more viewing area than 16:9 displays and offers a more natural reading experience for full-page documents. The Pro Tablet 608 comes with audio support for Cortana and videoconferencing and advanced security features demanded by business users. It measures 8.35mm thin and weights under one pound, and is designed for durability with Corning Gorilla Glass 4 and a metal-reinforced chassis. It includes dual front-facing stereo speakers, dual microphones, DTS Studio Sound and noise-cancelling software along with a front-facing 2 MP camera and an 8 MP HD main camera. HP promises up to eight hours of battery life from the Pro Tablet 608, which is powered by the latest generation Intel Core Atom Quad Core Z8500 processor with up to 4 GB of memory and 128 GB eMMc storage. It’s also HP’s first tablet to feature a USB-C port for fast charging and data transfer. Optional accessories include a pen, rugged case, travel keyboards and a portable dock. HP sees developing mobile solutions combining hardware, software and services focused on the needs of specific vertical markets as key to future success in the mobility space, and it’s working with ISVs to help realize that vision. In the aviation, HP and Lufthansa Systems are developing mobile cabin crew solutions and applications that they hope will both improve crew satisfaction and make for a better flight for you. Lufthansa’s mCabin solution has already been paired with an HP ElitePad 1000 G2, and the vendor says the Pro Tablet 608 could be a fit when a smaller device is needed. In the retail space, the HP Pro Tablet Mobile Retail Solution pairs the 608 with support for a range of third-party mobile payment terminals, including EMV, NFC, MSR and most digital wallets. The HP Pro Tablet 608 G1 running Windows 8.1 Pro will be available in July starting at US$479, and the Windows 10 version will begin shopping in August. 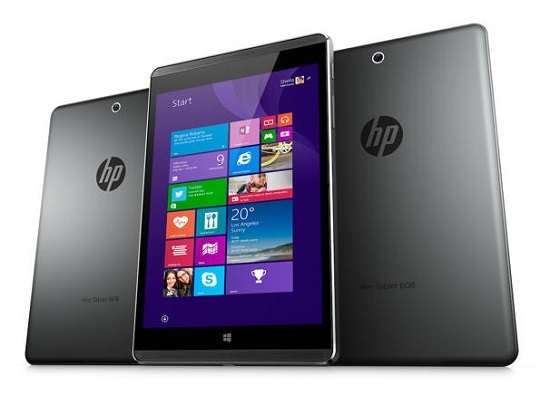 The HP Pro Tablet Mobile Retail Solution is expected to be available in October.